this month you basically get an elaborate version of the question: How do you deal with different versions of your documents? I find the image to the right quite inspiring. It shows a piece of the front cover of the script for Sky Captain. This seems to be typical for the domain of Hollywood movie making. 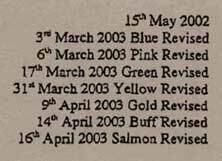 Several revisions of the script clearly identified by date and code-named by color. Note, that the salmon script is even printed on salmon colored paper! This makes is very obvious to the entire team at the set if one actor uses the text of an outdated revision of the script. For my personal documents – while they are under development – I use an extension schema "_v01", "_v02", etc. This becomes very useful when I share the document with review partners. It is also a very simple and robust way to get back to certain better sections in former versions. For online documents I try to keep the URL fixed. That means that the latest document has always the same URL. An older version gets again an extension, mostly by date. In the context of intranets this has proven to be very useful. You simply update the file and all URLs that are flying around in e-mails are still valid. This is also the way how the W3C groups organize their working documents. I also opt for history sections in text documents. They clearly state who made when which change to the document. Now it is your turn. How do you deal with different versions of your wire frames, prototypes, mockups, sketches, specifications, papers, or what so ever?